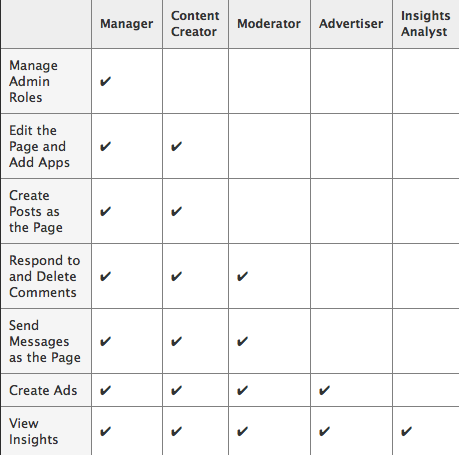 Admin roles can be changed in Facebook fan page or business page as the need arises. For example, if you are a creator of any fan page, then you are the primary "Manager" of the fan page. This fan page may be created for your clients or for your own personal thing. One who is creating any fan page for others, then after getting some likes for that page, the page needs to be handed over to the client. In that case, the admin roles changes for that page. There are different types of roles while managing admin roles. As a "Manager" of the fan page, you can set anyone as the above admin roles. As the role changes, their accessibility also changes. The below image will specify what actually is accessible in Facebook fan page according to your admin roles. A manager is the main person of fan page. He has all the accessibility for doing things in Facebook. Like he can manage admin roles (which is only for him) , edit , create posts , create ads and view insights. Whereas other roles will not have all of these roles. Their accessibility changes as set by the manager of the fan page. In the Facebook fan page, click "Edit Page"
Now what role you have designated to the person added will have only permission to that role and cannot have all the options that a "Manager" has. Think carefully before setting an admin role.